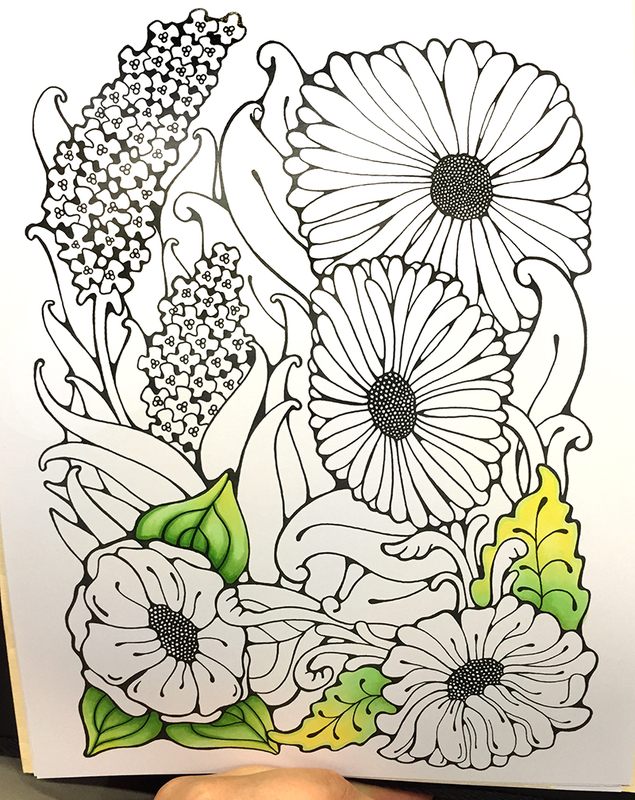 This weekend I was at an event and I had a chance to color one of the flowers coloring pages I drew this Summer. It really is a relaxing way to pass time, working on a larger project for a few hours. I drew this image for our Coloring Flowers Line Art Pack. The images in our image packs are printed on the nice Art Paper we use in the Copic Sketchbooks. 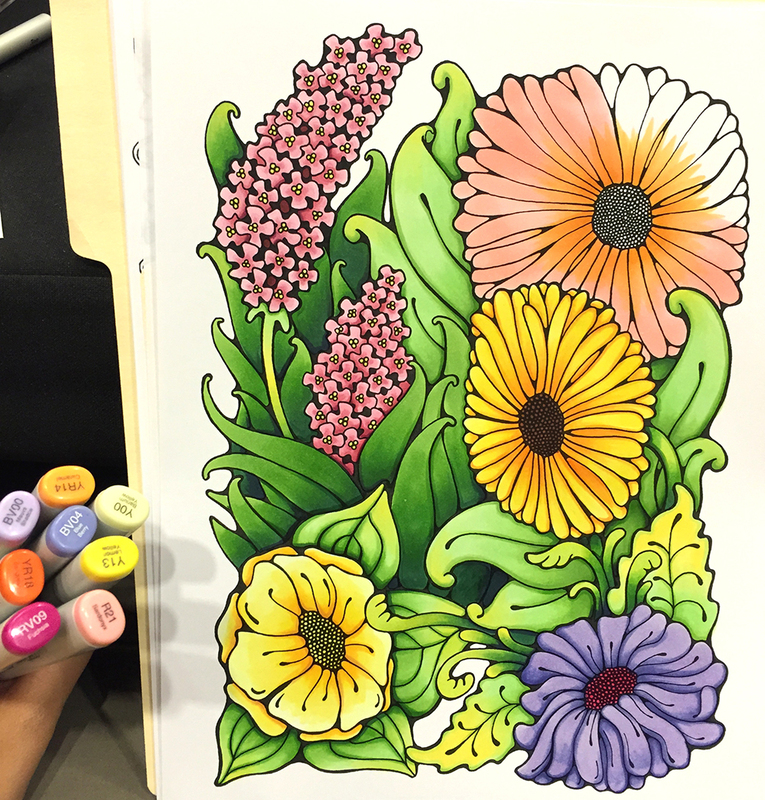 Anyways, I was coloring on a folder on my lap, and I had only a limited color set with me. Even with few colors, I was still able to have a lot of fun coloring with depth. 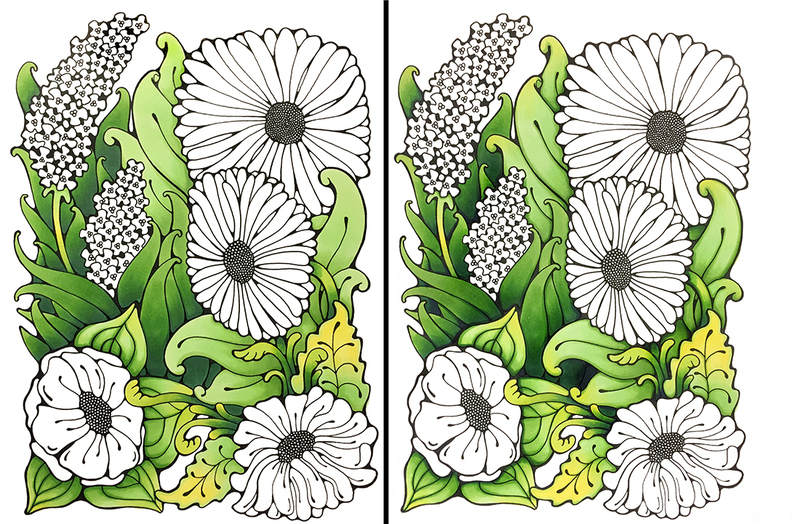 I wanted to share the power of having only a few greens and how you can add extra depth to your coloring. As you can see, these kinda large, goofy flowers have a lot of different foliage in them. But with a limited range of greens, how could I create more color variety? I had only YG11, YG13, YG17, and G28 for my green families. So, I had to pull out my Y13 to add some additional brightness to the leaves up front. The color you choose as a base makes a huge difference when you are working with layers of light colors. 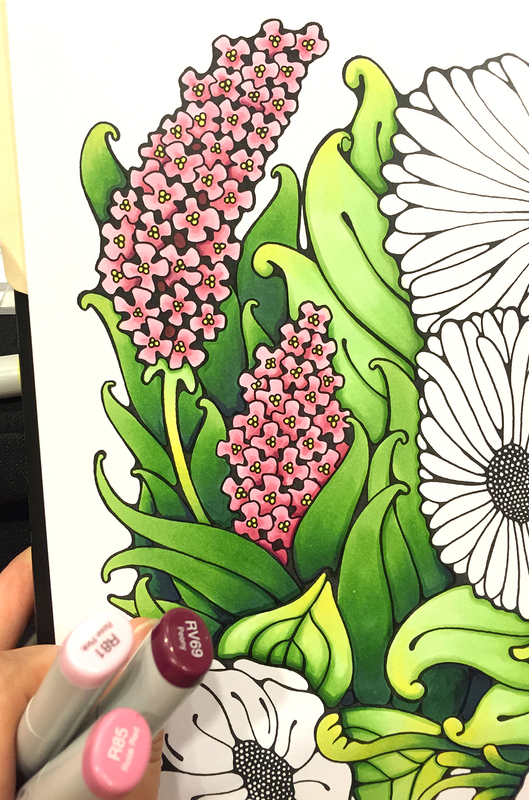 Evenly soak your base color by coloring in circles, using the side of the brush nib on your Sketch or Ciao marker. 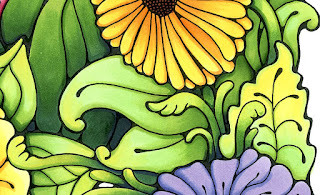 If you look at the flower on the bottom left, it had a base of YG11, with yellow added on top. 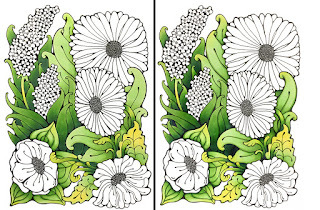 The flower on the right I colored in reverse, with the base of Y13, and the YG11 was added to the top. I shadowed each leaf with YG13 and hints of YG17. I wanted to make a layered look, with the viewer being able to easily pick out the leaves in front, then the other leaves fading into the background a bit more. However, I still wanted the viewer to feel that the leaves were from different varieties of plants, even though I had limited colors. Here is the rest of the leaf area, colored with only Y13, YG11, YG13, YG17, and darkest areas colored with G28. If you look closely at the side-by-side comparison, you'll notice some subtle finishing touches that add extra depth and interest to the image. the image on the right has extra layers of color around the edges and veins on the leaves. Basically, on each leaf, I took the color that is one step darker than the base color of that area and accented edges, veins, shadows, etc. I spent way too much time fussing over the leaves, probably 2-3 hrs on the leaves alone...except that I was at an event and constantly being interrupted to answer people's questions, so maybe it only took an hour or so of continuous time. 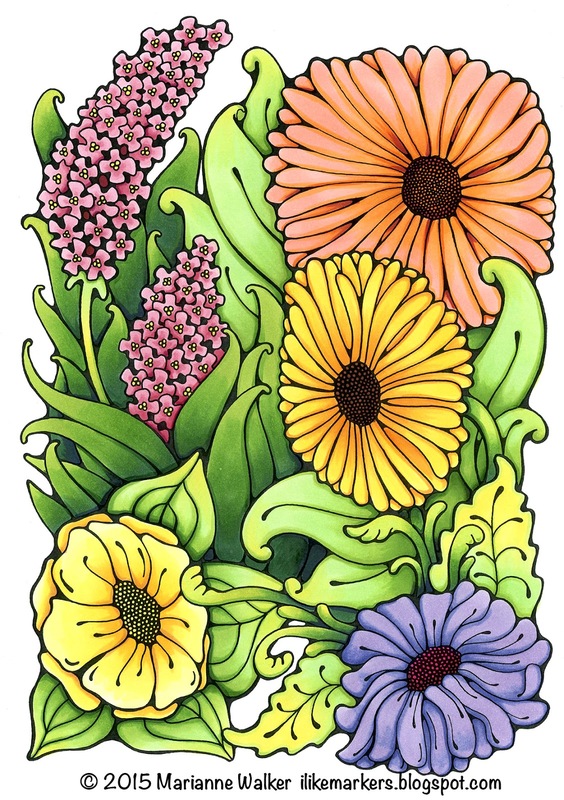 Then I moved on to coloring the rest of the flowers in the picture. Remember, I had only a few colors, so the pink flowers were colored with R81, R85, and RV69. The centers were colored with Y13. The two yellow flowers were colored with Y00, Y13, and YR14 and YR18 for the deep shadows (I used more YR14 and 18 on the darker yellow-orange flower). 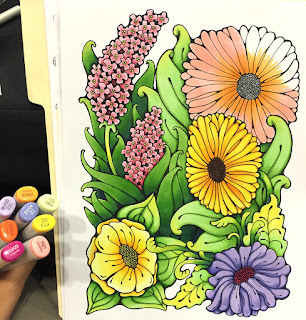 The purple flower was colored with BV00 and BV04. The center is colored with RV09. 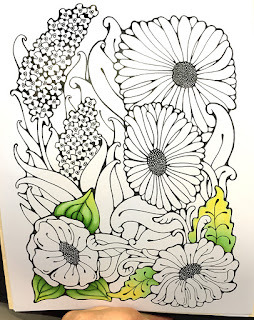 The top, coral-colored flower was colored with a base blend of YR14 and R21. If you look at the bottom image, you can see how the YR14 was flicked out from the center, about half way across the petals. The tips were left white. If they hadn't been left white then the R21 overlay would have been lost in the base orange. R21 was brought in from the tips and colored back into the darker YR14. To darken the shadows and edges of the petals on the coral flower, I used more layers of YR14 as well as YR18 and hints of RV69. Overall, I love how different this came out than most of my other work. It was a lot of fun! Now, it will promptly find a happy place in my portfolio. Hurray! I've been waiting a month or two for the main shipment of my new book to arrive. 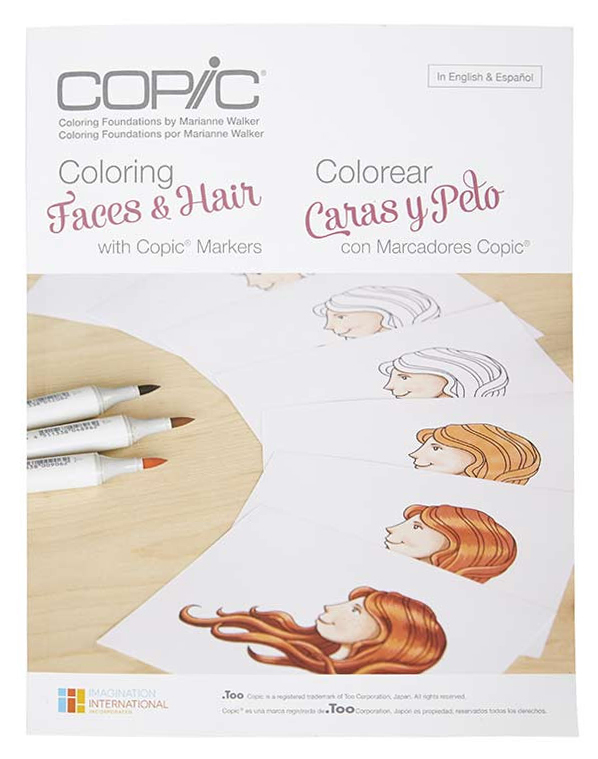 We just got our shipment from the printer and so finally, you can purchase your very own copy of the new Coloring Faces and Hair with Copic Markers book. This book is full color, 52 pages, of great information, and suggested price is only $9.95! 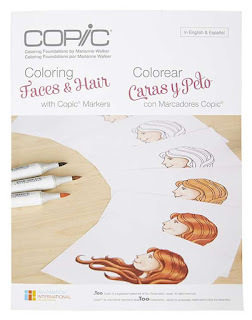 I tried to fill this book with useful tips and tricks for anyone who is trying to color faces, skin tones, and a wide variety of hair styles. The back of the book has blank images and assorted color charts you can photocopy and practice right along with the tutorials. 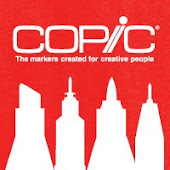 Even if you've been using Copic markers for a while, I think you'll find some great stuff in here. 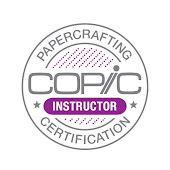 Don't want to make photocopies of the artwork? Don't have the right paper to print on? 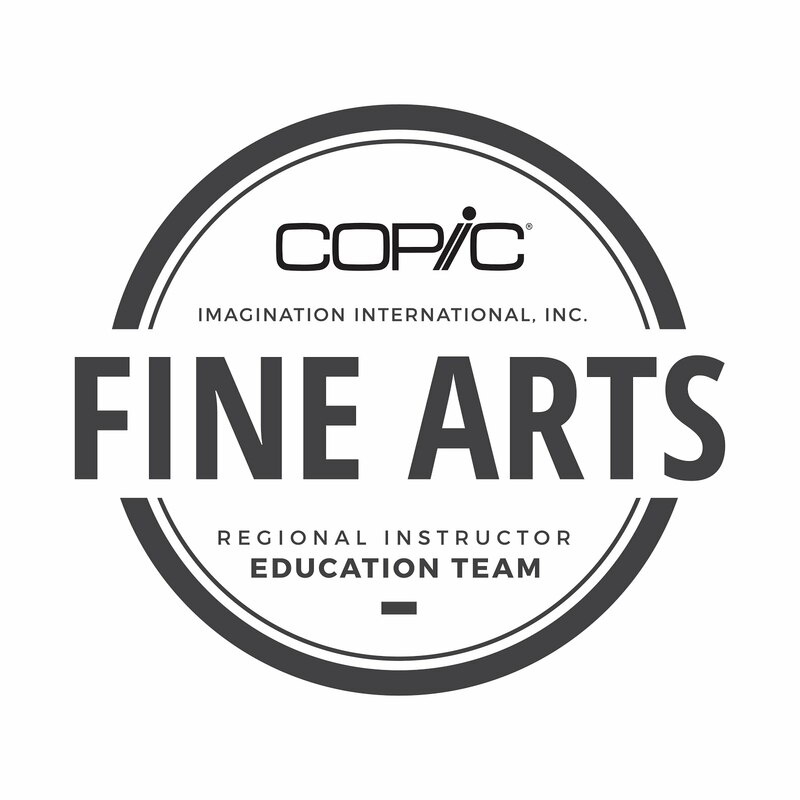 You can also order kits which include pre-printed images and color charts. 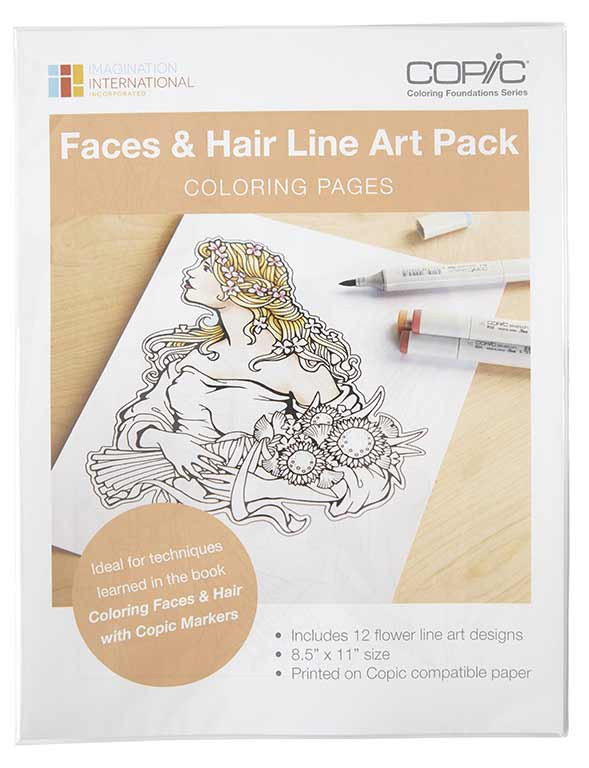 These kits are available for both he Faces and Hair book as well as the Coloring Flowers book. 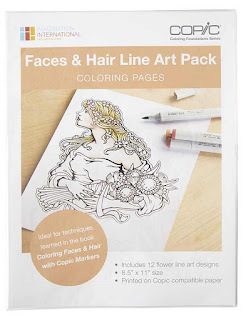 Along with the books, there are matching Line Art packs, images that go along with the books but are full pages printed on high-quality marker paper. I drew these images in styles that match the art and tutorials found in the books. So, you get a wide variety of fun images, all 8.5" x 11" printed on high-quality marker paper, ready to be colored in. Right now I am deep in the process of writing the next two books in the series, Intro to Coloring with Copic Markers and Coloring Cats and Dogs with Copic Markers. Look for those titles coming out in a couple months. This morning I was working on a piece of art for a poster, and I was experimenting with the sky. I thought you might enjoy seeing a bit of the process. 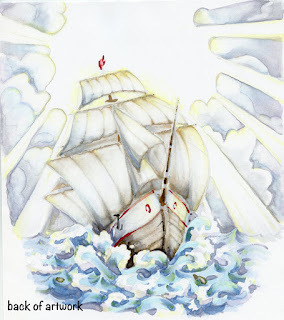 I wanted to get a very wet, watercolor look with my markers, so I decided to color a printout on inexpensive copier paper. 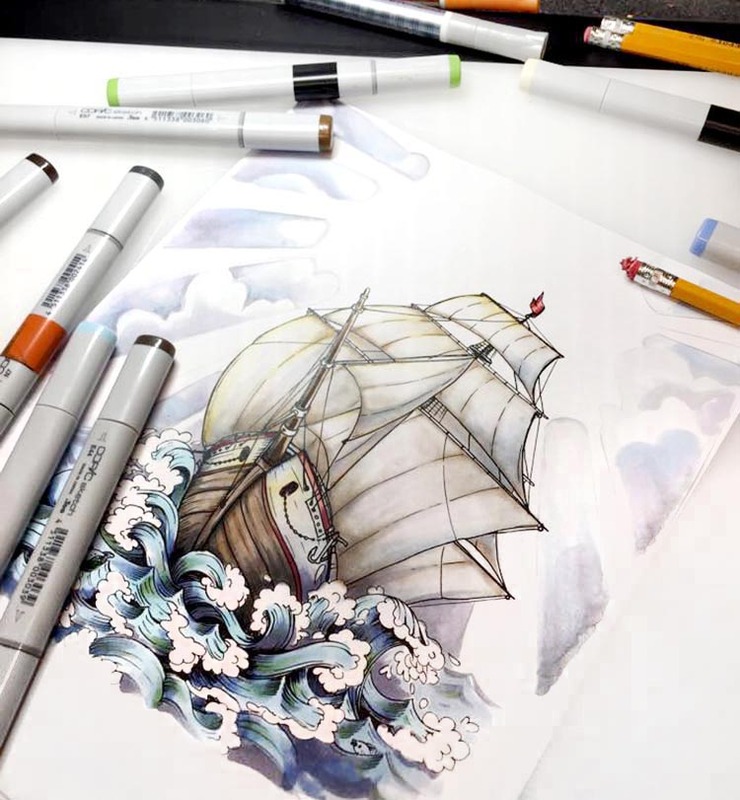 (you can also color much faster on this paper as it uses so little ink). When you work with many layers of subtle colors on thin, soft paper it is much easier to move around. I used C0, C1, C3, B41, BV000 and BV23 on the sky, along with colorless blender. (I lightly drew the cloud shapes in pencil so the lines ween't very dark). I added final highlights with Y00, then I used a LOT of blender. I used the chisel nib, as it was a great way to push and mush subtle colors together on large areas. 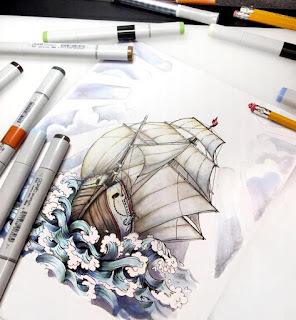 On thin paper, you need to be extra careful, as the color will want to keep spreading long after you are done, so around the edges of an area, you might find yourself going back with many light, careful layers of blender. To show you how much blender I used, here is the backside of the paper. See how soft and washed together the colors are? That is due to the colorless blender. The backside has a very different look, once you remove the dark black lines. (I really like it!!) However, for this project, I need a black and white version as well as the colored version, so I needed to run with the outlines. 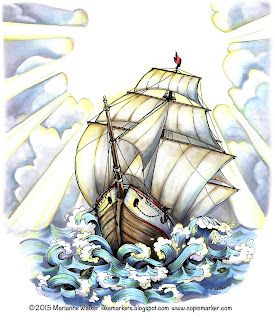 For the rest of the ship, I streaked in colors like W1, E42, C1, C3, BV23, E44, E57 and E29. I used accent colors of R32 and R59. For the water I used B00, B34, B41, G24, BV23, BV000, and Y00. Here is the final version, with all the yellow highlights and extra color added into the shadows. I think my client will really like this for the poster they need. If you get a chance, experiment with soft, watery coloring and using colorless blender on a thin paper to see if you like the results. If you want your own antique sailing vessel to download and color, you can download one from our website here.